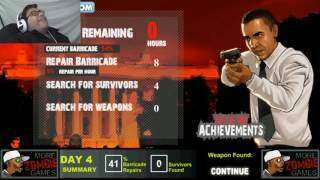 Click on the Play Button and 'Obama Vs Zombies' will start after this message... Thanks for waiting! You're the only survivor on Earth and must protect your house against the zombies. Each time you kill one you'll get money you can spend on new weapons. Save your brain! Zombies are attacking the White House and Obama has assembled a barricade to try to resist while he waits for help. Find survivors and weapons and hang in there!